Those whose occupation or life mode requires regular work with emails or business correspondence have to use various software tools to make things easier. Most of us are familiar with Outlook and other clients, by aid of which we can access and operate your mailbox any time. 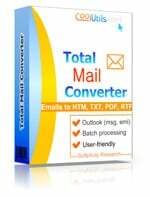 So if you have several MSG files and want to import them to Outlook, Total Mail Converter offers you a shortcut. Convert MSG to PST and import all emails as one PST file - isn't it convenient? There are several third party email converters. 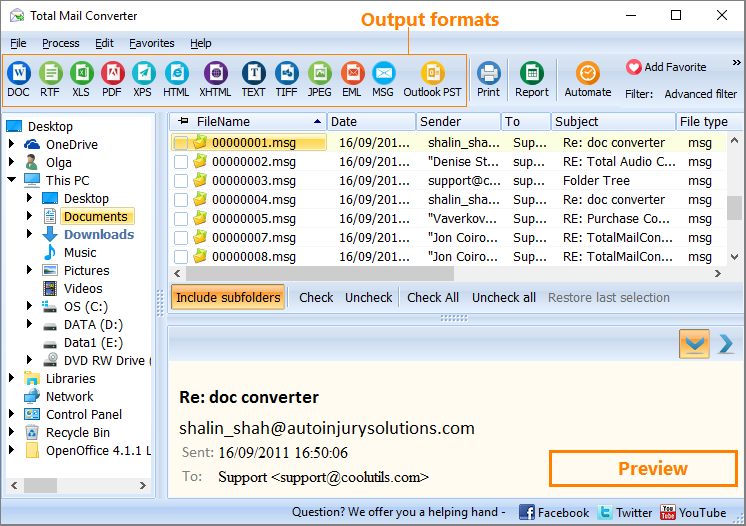 For example, you can use EML to PST Converter, Email Converter, etc. The interface has a broad spectrum of options. Literally, it works in what can be termed an all-cards-on-the-table fashion. In other words, once you launch the interface you can see all tabs, menus and buttons that are incorporated conspicuously into the interface. 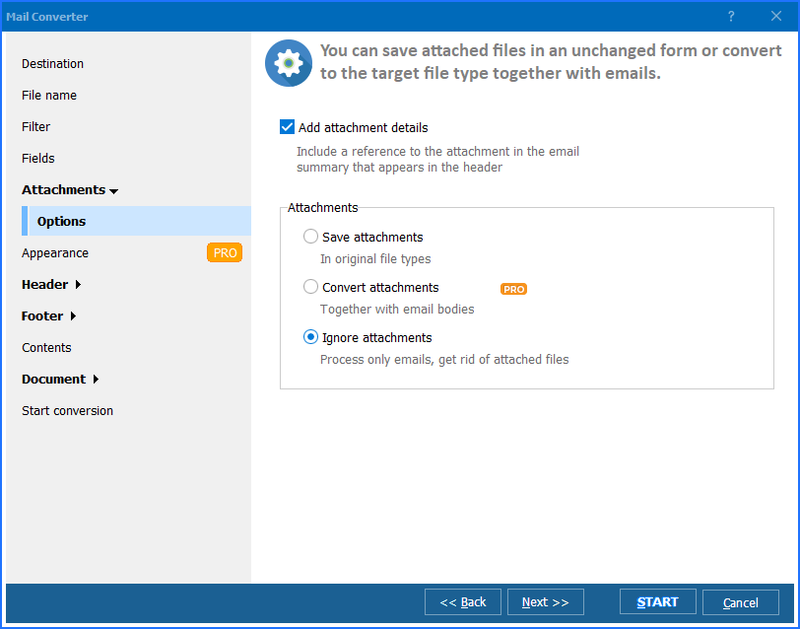 Run it and left-click on the folder with MSG files in the file tree, then view the checkbox list and tick the needed messages. To batch-convert, press the "Check all" button. The engine will check all the MSGs in the folder. To process messages contained in subfolders, check the "Include subfolders" option. Using the batch option, you can process any number of messages. 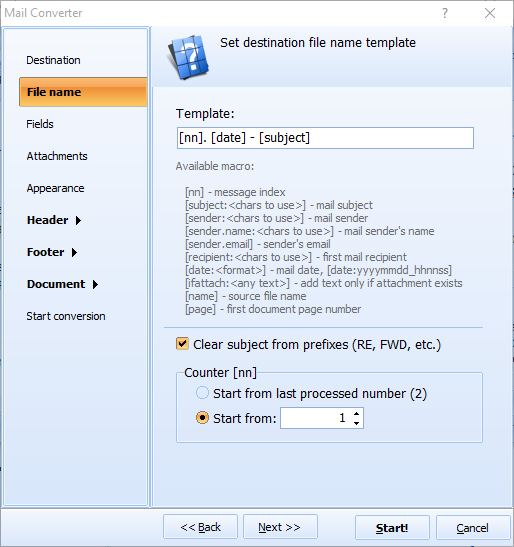 Select "Outlook PST" in the toolbar and navigate the wizard's options. Set the destination for the output PST file. Select "Start Conversion" to run through your selected conversion parameters and press "Start!" to convert MSG files to PST. You can download the free version and use it for thirty days. Many users prefer not to wait until the trial period expires. Use your preferred payment method and receive the license version right now!